Greg Tothill commenced his artistic career in the commercial world as an award-winning graphic designer. Unfortunately, early in his career Greg suffered a significant health challenge which forced him out of the workforce for an extended period of time. Not all was lost however, as Greg claims it was during this testing time that his artistic eye matured and his understanding of the subtleties of light developed. "The artistic eye continually evelves and it was during this period of enforced rest that I was afforded the time to just look, really look, and understand more clearly the nature and beauty of light and its effects on all things." states Greg. As Greg's health improved he began to dabble with the "paint brush" painting small plien-air water colours of the local landscape and coast. Success was immediate and Greg was soon approached by a leading Perth gallery where, in 1997, he held his first sell out solo exhibition. A second followed in 1999 and since then Greg has gone from strength to strength in his painting career amassing some 98 art awards including a number of both national and international significance. As a result, Greg's work has found its way into many distinguished collections throughout the world. Greg remains a highly sought after artist with a very strong, loyal following with many clients holding multiple pieces in their personal collections. It is not uncommon for some to have entire rooms in their homes devoted to hanging there precious "Tothill's". 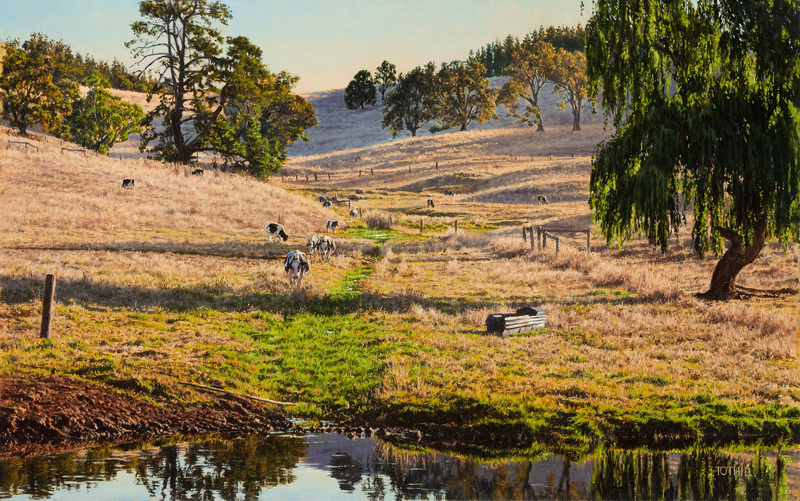 Inspired by the masters of old and a number of contemporary masters today, including the late, great West Australian master Michael Challen, Greg works in the demanding style of traditional realism. Greg States..."I am a believer in the old fashion, time honoured precepts that govern good art namely, good draughtsmanship, sound composition, colour harmony and technical excellence. I also, as if by instinct, take great pleasure in rendering a subject truthfully in all its components and revel in the small details, the minutiae, which when woven together, complete a harmonious whole. Not withstanding this, it is my sincere desire, and undoubtedly the ultimate aim of my vision, to not only render a subject faithfully, but to also capture th less pronounced, intangible qualities such as atmosphere, emotion, and beauty-a sense of place, or soul. When this is achieved, I have actually painted 'art". Greg currently lives with his wife and three children painting out of his coastal studio fulfilling supplying Wylde's Art with many fine pieces for public viewing and purchase. Wylde's Art is proud to represent Greg Tothill. Copyright © 2019 Wylde's Art. All Rights Reserved.